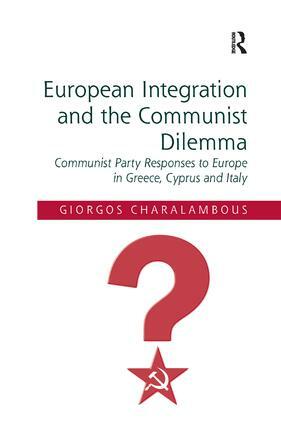 European Integration and the Communist Dilemma assesses the response of communist parties to European integration using three contrasting and comparatively significant case studies from Greece, Cyprus and Italy. These parties, in common with other radical parties in Europe, face a continuing strategic dilemma with regard to Europe through which larger questions about communist ideology and identity can be illuminated. Exploring the tendency of communist parties to face a trade-off between domestic legitimacy and electoral concerns, and their nature as parties professing opposition to the systemic currents of capitalism and European integration, the author provides a fascinating study of the nuances in deciding whether to adopt ideological consistency or undergo moderation. Blending advances in party politics, communist history and Europeanization research, the book devises a framework that overcomes the deficiencies of uni-dimensional approaches to the study of parties and Europe. In this manner, wider insights on the national party politics of European integration are drawn. Dr Giorgos Charalambous, University of Cyprus.